I had an interesting conversation with a friend right before Pesach. We were chatting about when people start to get ready for the holiday – some after Chanuka (! ), many after Purim (me included), and some (like her) who wait until just before Pesach. What made the talk most interesting was how happy and confident my friend sounded when explaining why she was in no rush to start. While I was feeling so smug about having written a blog series that included a Pre-Pesach No Panic Checklist to avoid all the chaos that I assumed naturally came with the holiday, my friend hadn’t started yet and wasn’t feeling any of the anxiety that I had been feeling for weeks. Yes, my friend has a lot of hired help to provide that sense of calm, but what really resonated with me was her comfort with not needing everything done before the holiday started. Of course she was cleaning her home and removing all the chametz, but when it came to cooking, she was OK with leaving some things for during Pesach. Not just OK, she actually preferred it. She looked forward to preparing her food fresh (when permitted of course) while her kids played and her husband went to shul. My preparations before Pesach – and any holiday, really – are focused on one goal: all food that can be made in advance should be. I love the feeling of entering the holiday knowing I have nothing to cook for at least 4 or 5 days. It’s like my own mini vacation. I get to sit on my couch and read magazines, play with my kids, go to shul, and take many, many walks. A similar conversation happened after the holiday – but in exactly the opposite way. I was telling my students how I went to bed on the night Pesach ended, and left the kitchen turn-over (from Pesach to chametz dishes, etc) for Sunday morning. They looked horrified. How could I, self-proclaimed time management consultant, not want to rush through the clean up so I could bring the chametz in as quickly as I could? While I was sound asleep, they were busy helping their parents move dishes, cleaning floors, packing away boxes, and waiting in line for bagels and pizza. They couldn’t imagine waiting a few extra hours on Sunday before ingesting all forms of leavened treats. I, on the other hand, was perfectly content to feed my kids Matzah Pizza for one more day so I could have a good night’s sleep. The thing about being organized is that there’s no exact definition from person to person. What I tell my clients, and what I relearned for myself from these conversations, is that getting organized is about finding what works best for you and your family. If getting ready for Pesach in December gives you a sense of calm then that’s what you should do – as long as your household is on board. If easing your way into the holidays is more your speed, go for it. And if you’d rather grab a few extra zzzzz’s while the rest of the world is eating half-baked bagels and pizza, do it. There is no right and wrong. What works for me will probably not work for you. 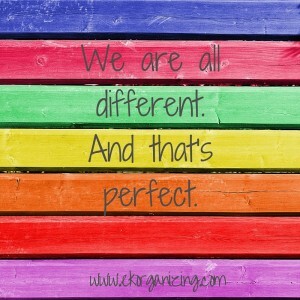 We are all different. And that’s perfect.